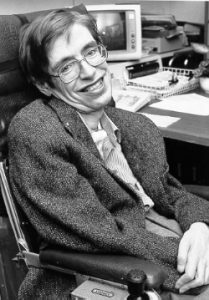 Earlier this month the world was saddened to hear of the death of Professor Stephen Hawking, arguably one of the most famous physicists of recent times. He died peacefully at the age of 76, having lived with the debilitating condition of motor neurone disease which he was diagnosed with in his early 20s. Despite that he contributed hugely to science and its popularisation. This month we discuss the scientific achievements of Stephen Hawking, his inspirational impact on younger generations, as well as what he was like as a person to work with and to interact with. I’m joined by Professors Peter Coles, Mike Edmunds and Bernard Schutz, all of whom met and/or worked with Stephen. In addition, a number of members of the Cardiff Gravitational Physics Group describe what got them into physics, and the effect that role models like Stephen Hawking had on their path. An extended edition of an original broadcast on 28th March 2018 as part of Pythagoras’ Trousers on Radio Cardiff.